By Joanie Harmon, published Dec. 9, 2013 on UCLA Ed & IS Ampersand. 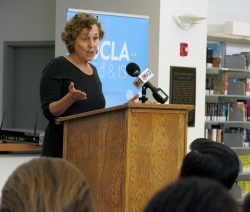 UCLA’s Graduate School of Education & Information Studies, the Los Angeles Unified School District, and the nonprofit Code.org collectively launched the Los Angeles segment of National Computer Science Education Week at the UCLA Community School on Dec. 10 at the Paul Schrade Library at UCLA Community School, with local and state lawmakers, and industry leaders from Microsoft, Apple, Google and other Los Angeles–based technology companies in attendance. Smithsonian: Is Coding the New Second Language?